The following tips are taken from an article to be published in a future edition of BandWorld Magazine. For subscriptions and more information about BandWorld call 1-800-247-2263. 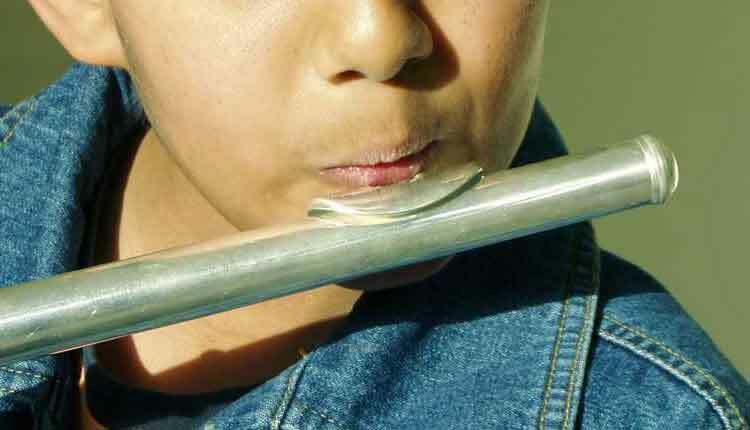 The teacher should place the headjoint up to the student’s lip. Instruct them not to blow until you tell them. Center the flute and then tell them when to blow. They should use the syllable pu, not who. This will keep the aperture as small as possible. If the student has a tear drop lip, you may need to move the head-joint into a position that will allow for a better sound. When they make a sound, praise them. It does not need to be a perfect sound. Praise any sound they get. They are scared to death that they will not get a sound, so be encouraging. Have them produce the sound several times without removing the head-joint from their lips, or moving your hands. Then, remove your hands and have them produce the sound again. If they have trouble getting a sound when you move your hands away from the head-joint, with one finger or the thumb, push the mouthpiece against their lips. The students should practice the headjoint only for the first week. Even if it is only for ten minutes a day. This will help develop the muscles in the lips and help to keep the aperture small. Show them how they can get different sounds by putting their finger into the end of the head-joint. I will play Mary Had A Little Lamb by adjusting the depth of my finger into the opening of the head-joint. Then, I will challenge them to try it over the next week. Tell them to practice every day. If they do not get a sound when they get home, not to worry, just keep trying. They made a good sound at school, and it will happen again. Be positive! You cannot over praise a student’s sound and efforts. Remember, the students are very scared that no sound will come out of the instrument, or it will be a bad sound. If you are expecting a perfect sound or demanding a perfect sound at the first lesson, you will be very disappointed, and you will be extremely discouraging to your students. Any sound they get should be praised. Even if a student does not get a tone on the first lesson, be encouraging. Tell them to keep trying. They will do it if they keep practicing. The students trust you, and they will try very hard for you if you show your enthusiasm for their progress. Sharing your joy of music with them is the real art of teaching. That is when teaching is fun for both student and teacher.